Jim Cooksey cuts the ceremonial red ribbon to signify the center’s official opening. l. to r. WSJAC Assistant Coordinator Andrew Jones, BOL President Bob McCall, SBCTC President Robbie Hunter, WSJAC Area Coordinator Collin Keisling, Cooksey, Charmayne Cooksey, IP Newton Jones, IVP Tom Baca, and Jenny Farney and Dan Klingman of Lincoln Electric. More than 75 Boilermakers and guests celebrated the grand opening. 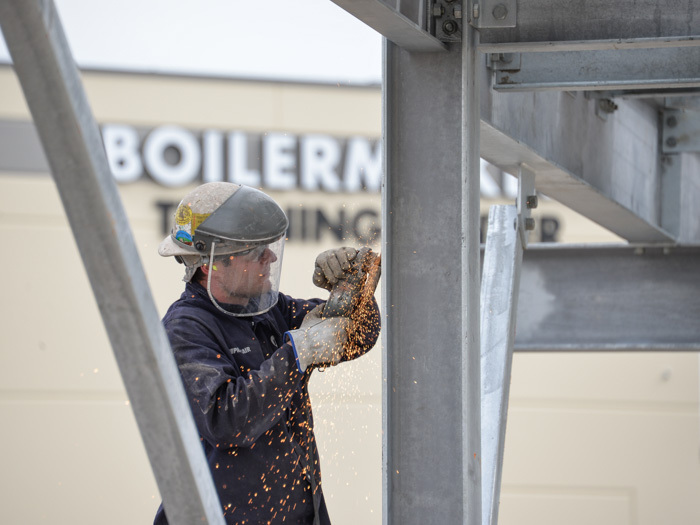 Boilermakers worked up to the day to complete the center’s outdoor rigging tower. 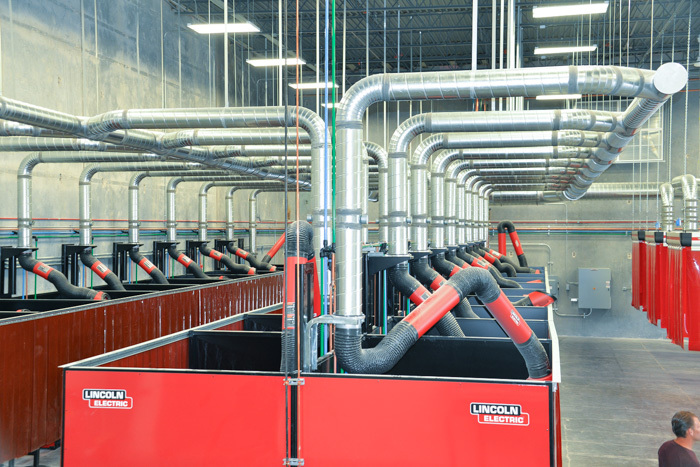 The center’s 30 welding booths are outfitted with an advanced fume exhaust system. 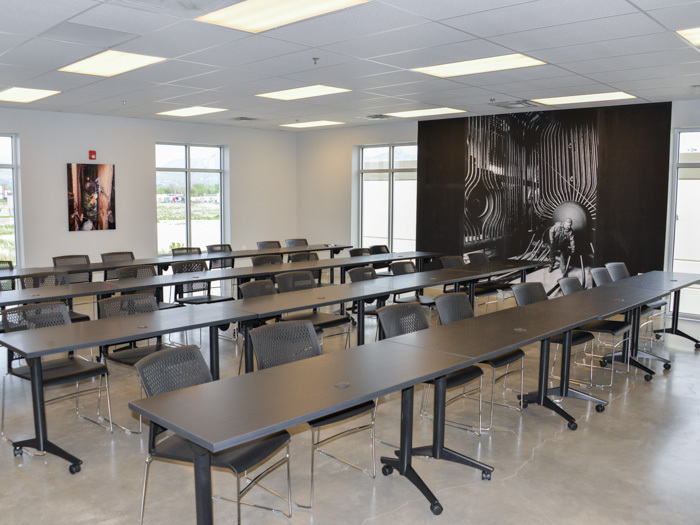 Two state-of-the-art classrooms are wired for training technology while giving a nod to Boilermaker history. 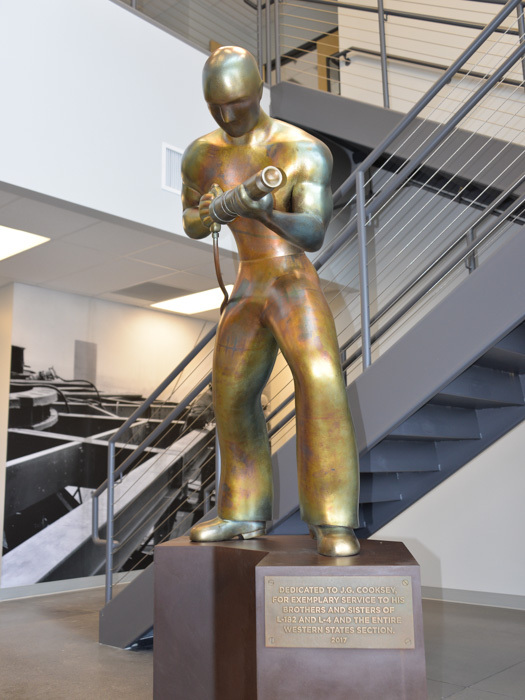 A bronze Boilermaker riveter statue greets guests in the lobby. Jim Cooksey takes in the grand opening of the center that honors his dedication to Boilermaker recruiting and organizing. The Boilermakers name looks out from two sides of the center, proudly advertising the new center to travelers along Interstate 215. Among the guests were owner representatives from Andeavor, Chevron, PacifiCorp and PBF Energy, including three refinery plant managers. Refinery work for Boilermakers has surged in the Western States, particularly in California, where the state now requires that at least 60 percent of journeymen be graduates of state-approved or federally-approved apprenticeship programs. The new 18,000-square-foot J.G. 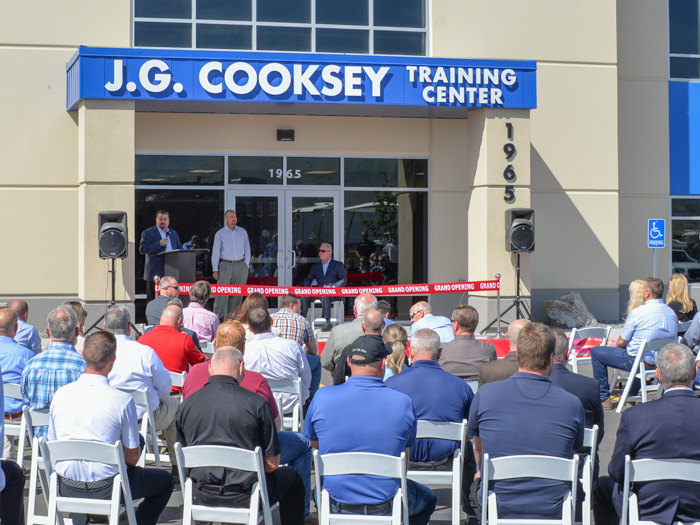 Cooksey WSJAC (Western States Joint Apprenticeship Committee) Training Center includes modern classrooms, state-of-the-art robotic welding equipment and 30 welding booths with an advanced fume exhaust system. Adjacent to the welding booth area, with its 30-foot-high ceiling, is a massive open space with oversize garage bay door access. It’s a blank slate just waiting to accommodate nearly any kind and size of apprentice practice project. Outside, anchoring the property is a Boilermaker-built rigging tower ready to be put to work. It’s all top-of-the-line, and it’s spotless. The building itself also serves as a sort of advertisement for the Boilermakers union. 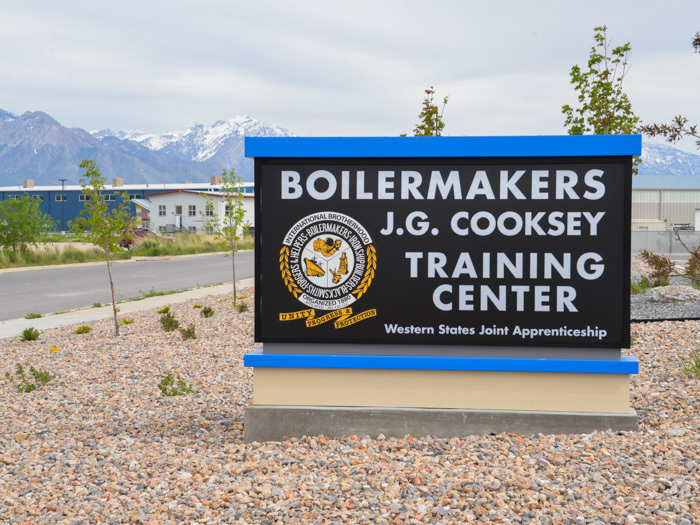 With the Boilermaker name boldly visible on two sides of the building that face busy Interstate 215, it’s hard to miss. The center is named in honor of Western States International Representative James G. “Jim” Cooksey, who got his start as a Boilermaker in Salt Lake City and is known for his recruiting enthusiasm and success. 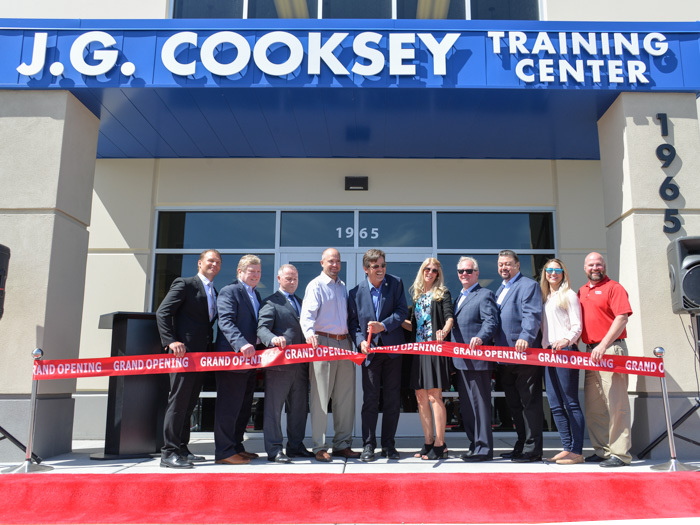 Cooksey, who is also an Assistant to the International President, told guests that he learned early in his Boilermaker career that the way to move up in the industry is to learn and work hard. “In this industry, knowledge is power,” he said. “The more you know, the more you’re going to work. The more you work, the more you’re going to be able to maintain a good living. And what the Boilermaker goes through to make a living, not everyone can do that. You can’t just fill out an application, show up and be good at it. 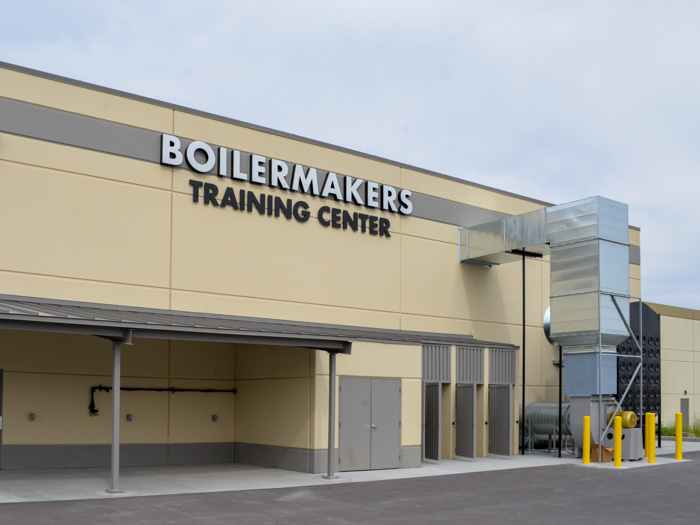 That’s why this training center will simulate what needs to be done and how you need to work as a Boilermaker. Financed through Bank of Labor, the training center is the first of eight new centers planned in the Western States. 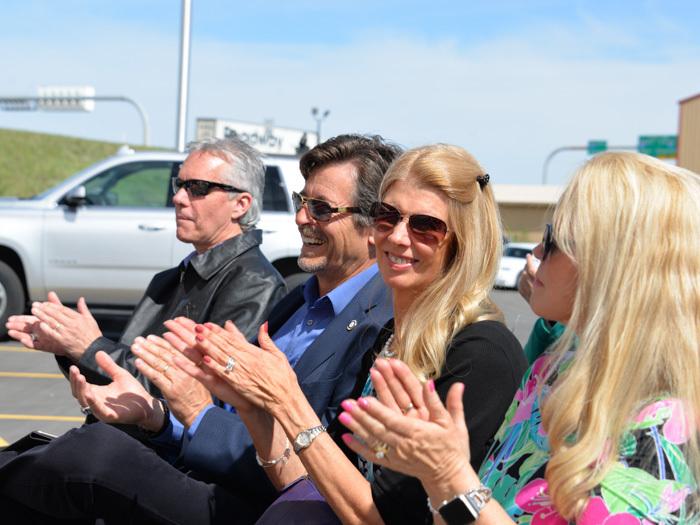 California State Building and Construction Trades Council President Robbie Hunter, who attended the ribbon-cutting as a special guest, told the crowd he looks forward to seeing the training center replicated. “There are going to be tens of thousands of kids who are going to go through this training center,” he said. “In these neighborhoods around us, there are kids being raised by their grandmothers. They have a hard life. They get put into school late. They struggle to stay there. A place like this is going to give those kids a chance to become something — to get the skills to meet the need and to make a living. Said IP Jones: “Decades from now, this facility and its instructors will have been responsible for preparing thousands of tradesmen and women whose professionalism helped build the nation’s essential infrastructure across multiple industries — from power generation to oil refining to steel milling to aluminum smelting and more. JIM COOKSEY LIKES to say he learned the Boilermaker trade “from the bottom, up.” As an 18-year-old in Salt Lake City, he was working as a busboy and at a gas station, living in (his words) a “dirt bag trailer” behind said gas station. Then he met Charmayne, his future wife. Charmayne’s father, however, must have noticed that Cooksey wasn’t going anywhere — literally or figuratively — so he got him a start at a small metals shop and on the right career trajectory. Cooksey joined the Boilermakers union in 1975, and for the past four-plus decades has dedicated himself to ensuring others have the opportunity to pursue a career as a union Boilermaker. He’s lost count of how many Boilermaker Brothers and Sisters he has brought into the organization, largely because he’s never not recruiting and organizing for the Brotherhood. It’s about paying the opportunity forward. “After 40-odd years in this organization, I sometimes wonder how far I’d have gone if I hadn’t found the Boilermakers,” he says. “I came in as an 18-year-old kid, and these guys over the years have taken me under their wings and taught me. And I had some great teachers.